Project Blackbox, Sun Microsystems' prototype of a self-contained, virtualized datacenter is making the rounds via flatbed truck. Still in Beta, the unit has everything--an entire data center--lovingly tucked into a single cargo container that's delivered by truck. Just hook up power, water, and data lines--then leave it in the parking structure or other secured area. You can now sign up to tour this unique unit when it's in your area. It's probably the most computing technology you'll ever see in a walkthrough of about 15 paces. The modular unit includes compute, storage, and network infrastructure ingeniously packed both to withstand shipping and for access, when maintenance is required, through a center hallway. The unit is also ready to face the elements and temperature extremes of life outdoors--nobody’s going to keep it in the parlor. 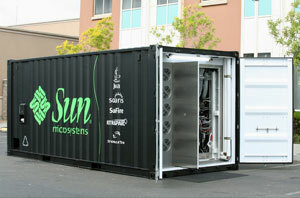 So why put a whole datacenter in a 20' shipping container? In an "EduConnection" article on Sun's web site, the company tries to offer a higher education context. Campuses trying to keep up with growth could quickly set up the datacenter in less expensive and easier-to-find areas like rooftops, warehouses, or garages. And the portable, ruggedized units could be deployed, relatively easily, to remote locations or re-deployed to alternate locations in an emergency or disaster scenario.